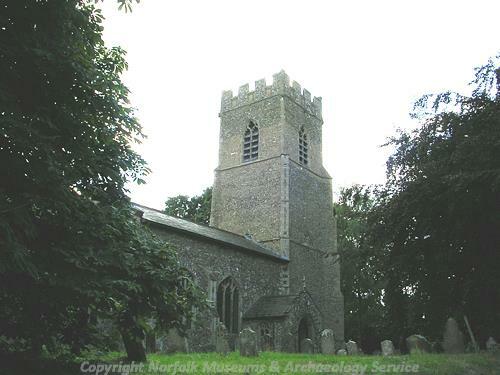 The parish of Garvestone is situated in mid Norfolk, about fourteen miles west of Norwich. Its name probably comes from a hybrid of Old Norse and Old English, meaning ‘Gaerwulf’s enclosure’. Today, the civil parish also incorporates the villages of Reymerston and Thuxton. The name Reymerston comes from an Old Norse or Old English personal name (Raimer/Regenmaer). Thuxton derives from the Norse Thurstan or Thorstein. Evidence of early activity in the parish comes in the form of scatters of burnt flints, prehistoric but not closely dateable, which are thought to have been connected with heating water for cooking or other purposes (NHER 22075, 22650 and 36290). The earliest find to which a reasonably accurate date can be ascribed is a Mesolithic or possibly Neolithic flint flake (NHER 5612), but this is the only example found so far in the parish. Definitely Neolithic finds are also scarce and consist of a chipped axehead (NHER 8835), a partly polished one (NHER 8834) and a wholly polished one (NHER 8837). A stone example has also been found (NHER 8836), and a stone axehammer (NHER 28058) may be Neolithic, although it could equally well be Bronze Age. There is as yet no evidence of any settlement during this period, but such evidence is always very scarce anyway. The Bronze Age has left the parish with possible evidence of its earliest structures. These are ring ditches, probably round barrows subsequently flattened by agriculture, and only visible as cropmarks on aerial photographs (NHER 11680, 17343 and 18818). A few Bronze Age copper alloy artefacts have also been recovered, including axeheads (NHER 25898 and 33571), a hammerhead and spear tip (NHER 25689) and a palstave (NHER 8846). It is not uncommon for the Iron Age to leave little or no trace of its passing, and evidence of human activity at that time in Garvestone is confined to a few pieces of pottery, found to the east of the Mid Norfolk Railway in Thuxton (NHER 25689). The subsequent period of Roman occupation, in contrast to the Iron Age, usually leaves a far richer body of evidence, but although the Romans may have left traces of the earliest settlement in the parish (NHER 40290), evidence of their presence is so far fairly muted. Pottery fragments (NHER 17595, 25689, 28374 and 30186) and coins (NHER 25689, 25898 and 39655) are the most common finds of the period, but other discoveries are currently limited to a brooch (NHER 36068) and part of a quern (NHER 8839). Saxon occupation evidence to date is a vessel attachment (NHER 37307), a coin (NHER 36068) and a Middle Saxon brooch (NHER 39655). 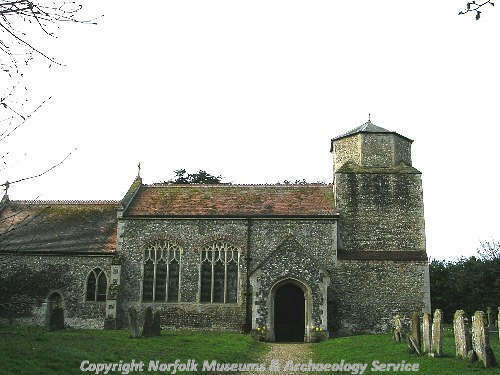 The medieval period has left the parish with its oldest surviving buildings, its three churches, St Margaret’s (NHER 8857), St Paul’s, Thuxton (NHER 8858) and St Peter’s, Reymerston (NHER 8860). St Margaret’s, restored in the 1990s, is 14th century and later, and has a possible privy and fireplace in its west tower, perhaps a rare example of its use as a priest’s house. St Paul’s, with its short west tower, has the earliest origins of the three. Although mainly medieval and later, the north wall of the nave is either Late Saxon or Early Norman. Inside is an important Norman font. St Peter’s is 13th century and later, the top of the tower being 18th century. Inside is a 15th century font, elaborate early 18th century communion rails imported from Belgium and fine Gothic Revival choir stalls. Other medieval buildings have not survived, but have left a footprint in the form of their surrounding moat, for example NHER 8838, and possibly NHER 8861 and 22073, though these last two are a little doubtful. On a larger scale, entire medieval settlements have subsequently disappeared. The remains of the medieval village of Thuxton (NHER 8842), once visible as low banks and ditches, has been largely destroyed by ploughing. Parts of two other settlements of the period have been noted, NHER 14572 being low banks and a well and NHER 40289 being a concentration of medieval pottery fragments. In the south of the parish was the medieval village of Calveley (NHER 11520), mentioned in the Domesday Book. This has vanished without trace. Some late medieval buildings survive as fragmentary parts of later rebuilds. For instance Street Farm (NHER 13057) was originally a hall house of about 1500, reconstructed in the 17th century and in 1800. The Haven on Town Lane (NHER 22801) was originally a 15th century hall house, again much altered later. Another example of the type is Reymerstone Old Hall Farm (NHER 8854), a late medieval timber framed farmhouse with later additions. 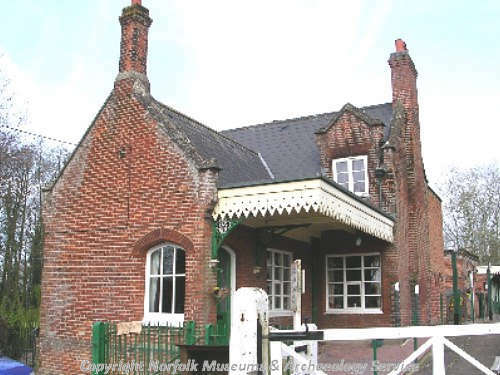 Valhalla (NHER 21612) is a further example, which has been restored in recent years. Quite a few small finds from the medieval period have been discovered in the parish, including pottery fragments (e.g. NHER 8851, 17595 22909 and 25898) and coins (e.g. NHER 20192, 28910, 29021 and 35267). Also from the period are a buckle (NHER 25689), a dagger guard (NHER 28910), a brooch and a key (NHER 29021) and four forged gold coins (NHER 8843). Early post medieval buildings worthy of note include Tudor Cottage (NHER 22906), Waterloo Farm (NHER 22908) and Church Farm (NHER 31640), which are all 16th century timber framed houses with later alterations. Gunton House (NHER 17595) is also 16th century and timber framed, with later brick cladding and a 19th century façade. There are strong indications that it was also the site of an earlier building, as large quantities of medieval pottery fragments have been found in the grounds. 17th century buildings in the parish include Calveley Hall (NHER 42017), a timber framed farmhouse with later masonry ends, Church Farm Cottages (NHER 33499), an early 17th century timber framed house now contained in a row of terraced cottages and Riverside and Old Elvett (NHER 42018), timber framed with later alterations. The 18th century saw the building of Rowanside (NHER 22907), also timber framed, and Reymerstone Hall (NHER 8855), which dates to 1781. North Green Farm (NHER 40524) is an early 19th century farmhouse added to the end wall of an older building, and Windmill House (NHER 41838), a former miller’s house, dates to about 1830. Industrial buildings from the post medieval period do not seem to have survived. A windmill (NHER 14474) is marked on 18th and 19th century maps, but today there is only a low mound. A brick kiln marked on an 18th century map (NHER 15274) has vanished entirely. The most historically recent site to be noted on the record is Shipdham Airfield (NHER 2773), a World War Two field in use by United States Army Air Force bombers from 1942. Most of its concrete runways were taken up in 1980 for use on the Swaffham bypass. Piet Aldridge (NLA), 3 April 2006.